The refurbs for this week are a little on the light side. The locks on guest rooms at Disney's Grand Floridian Resort are now in the process of being upgraded. Also going on at the Grand Floridian, the main courtyard pool is now walled off for work to begin on a major refurbishment. The pool is expected to reopen in late December of this year after being completely rebuilt and featuring a new zero entry sloped side. The Courtyard pool bar is also closed during the work. The resort's Beach pool remains open during the work. Work started this week on the Cinderella Castle Dream lights that make up the spectacular Cinderella’s Holiday Wish show, which transforms Cinderella Castle after dark with 200,000 sparkling white LED lights. The crane is expected to be onsite through the rest of September. 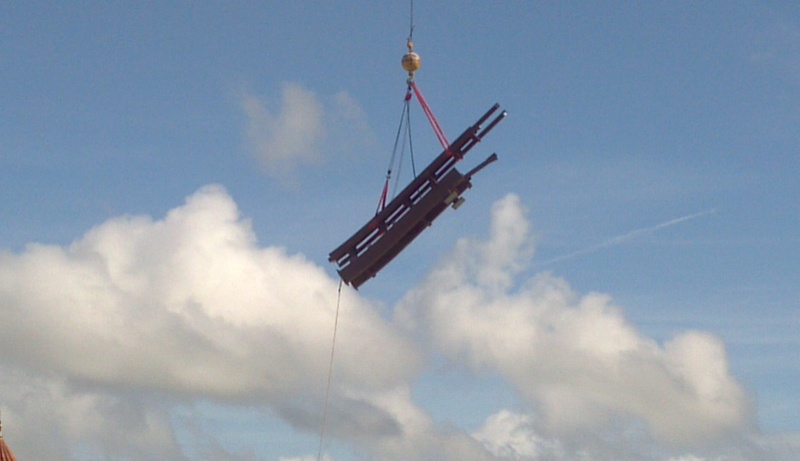 The pieces of coaster track spotted last month at the old STOLport have made their way to the Magic Kingdom and are being installed on the Seven Dwarfs Mine Train coaster. 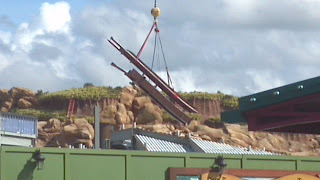 I was able to catch a couple of pictures of a section of the lift hill being flown into place. Disney has updated the dinner menu listing for the soon-to-open 'Be Our Guest Restaurant', including pricing. Pricing is in-line with what you would expect from other table service restaurants at Walt Disney World. Appetizers range from $4.49 for a salad, through to $14.99 for the Assorted Cured Meats and Sausages plate. Entrees start at $15.99 for the Rotisserie Cornish Hen, and go up to $29.99 for the most expensive dish, the Strip Steak. Desserts are all priced at $3.99, and are presented and served tableside. The pricing for Cirque du Soleil La Nouba will increase for performances beginning 9/ 25/2012. The new pricing will come into effect for bookings made after 9/16/2012. Any reservations already made will have existing pricing honored. A special fall edition of the Main Street Trolley Show is now playing at the Magic Kingdom. New costumes, music, choreography and props are used in the show. The show makes 4 stops along Main Street, and concludes in front of the train station. There are two different versions that show, alternating at each stop. Show times are typically at 9:15 AM, 10:10 AM, and 12:00 AM, starting outside Casey's Corner. The video below shows both routines, and a photo set from the show. Space Shuttle Endeavour began the first leg of its final flight to California riding piggyback on a 747. Its final stop will be the California Science Center. As part of its final mission, it flew directly over the Walt Disney World Resort, including Epcot and the Magic Kingdom. The flight took place before park opening on 9/19/2012, but fortunately Disney shot this great footage of the fly over. Disney has finally confirmed the schedule for the special events to mark Epcot's 30th anniversary on 10/1/2012. Throughout the day on October 1, guests can attend Epcot history presentations in World Showplace courtesy of D23: The Official Disney Fan Club. These presentations are included in park admission and are limited in seating. 1-2 p.m. – Designing the Future – Past and Present: A panel of Disney Imagineers remembers 30 years of building tomorrow! That evening, the October 1 presentation of “IllumiNations: Reflections of Earth” will feature a special 30th anniversary tag. The Nightmare Before Christmas' characters Jack and Sally will be appearing at Downtown Disney for a limited period later this month. The appearance is part of a "Frankenweenie" event. There will be meet and greets with Jack and Sally, photo ops, and special screenings of 'The Nightmare Before Christmas' and 'Alice in Wonderland'. The timings are still to be confirmed, but appearances will be next to the AMC Dine-In Theater during the evenings of September 28, 29 and the 30th. If you are a Disney Visa Card member you will receive access to the private Chase Lounge at this year's International Food and Wine Festival. Guests with a Disney Visa card will be able to enter the private lounge for refreshments. Located on the second floor of the Festival Center, it will operate daily from 9:00 AM to 7:00 PM. To enter the lounge you will just need to show your Disney Visa card.